We all look back at the 90s now as soon sort of nostalgic wonderland. Maybe it’s because we feel popular culture isn’t as good now, and maybe because we look back at the 90s as genuinely an incredible decade. I’m not sure, that’s down to what you think really. Whatever the case maybe, you’ve only got to look at pictures of things from the 90s to feel that rush of melancholic longing for a better, simpler time come back. It brings a smile to the face, but a tear to the eye, as we all secretly never want to grow up. So we’re going to take you on a trip down memory lane today. Here are 10 items from the 90s, and if you owned all of them, then you are the ultimate 90s legend! Who would have ever thought that this would have been a good idea? Looking back on it now, I’m not entirely sure why I wanted a Walkers themed pencil case, but then those Gary Lineker adverts did lurk around every corner in those days. How many of you remember the rush to get the latest craze of pencil cases on the eve of the first day of term? Good lord, it must have looked like the horns of the apocalypse could be heard on the horizon for the shopkeepers. As thousands of kids and their weary parents galloped into view, having already trashed M&S and every school uniform shop in the known universe like a plague of locusts, trying to find the latest Lucozade or Sprite pencil cases. Blood was shed, tears were lost, WHSmith was never the same again. I mean really, what were we thinking?! I absolutely loved Blockbusters, and even though Netflix and all those streaming services are obviously amazing, there is a certain place in my heart that will always long for the days when renting a video and getting a takeaway was a proper night in. For some reason, it just felt like more of an event. Driving there, browsing the aisles, deciding which genre to look at, discussing which films, maybe get a few and have a marathon? It was so exciting! And if you had a Blockbusters membership card, it was even better! With Netflix now, there is almost too much choice. Many have been the times that I’ve spent about 45 minutes scrolling through Netflix, trying to decide what I want to watch, and then basically deciding I can’t think of anything and then just watching the TV instead. Turns out you can have too much of a good thing. But with Blockbusters, it felt more special, it felt more like you were making a proper night of it by renting a video. And if you had older siblings, like I did, they would always rent videos and games that you probably shouldn’t have been allowed to watch or play with using their Blockbusters card. Board games really are a forgotten art these days, but they do still have their purposes. For example, three of the most dramatic, stressful, damaging and profound hours of my life were spent playing a game of Monopoly. In the end I lost, and as we all remember, a Monopoly loss is particularly dark. But whereas Monopoly is essentially a crash course in the cruel and heartless world of industrial and commercial capitalism, Screwball Scramble was a far more exciting and inclusive game. Okay, it’s was a bit manic, but I at least I didn’t have to worry about going bankrupt and having to sell off everything I own at ten years of age. Just like Pokémon cards and beyblades (until they got banned for some weird reason), Tazos were the thing to collect in schools back in the 90s, and though they have been in production for many years, back in the 90s, they were a hot property. 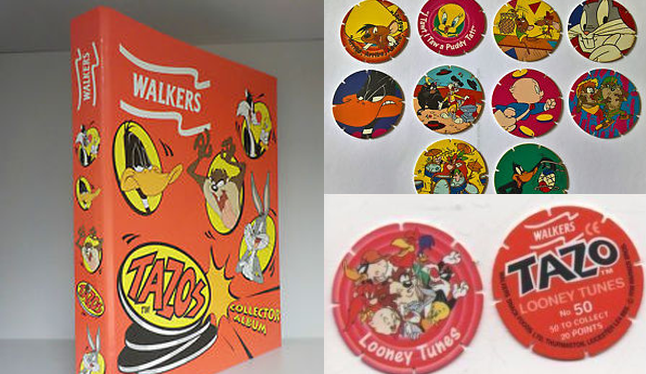 And companies jumped all over the idea to market their product in Tazos, from wrestling to Star Wars to Pokémon and everything in between, Tazos were the it thing! It seemed to be (and I could be wrong), that once Robbie Williams appeared at Glastonbury at 1995 in a full red Adidas tracksuit (and I don’t care what anyone says, he looked pretty cool), trackies were in. Well, maybe not, but that’s how it seemed to me. But in the 90s, for whatever reason, people seemed to wear Adidas trackies a lot more. In general, people seemed to wear things in everyday life back then that would look positively hipsterish now, but if you owned a pair back in the day, congratulations, you were a 90s legend! Tamagotchi’s were enormously popular in the 90s and early 2000s, but then technology developed to a point where children had moved past the powers of the handheld game, but in its heyday it sold millions of units. This is taken from his book The Rise and Fall of the Third Reich: A History of Nazi Germany, but because the book was written in 1960, William L Shirer understandably, through no fault of his own, made one crucial error in an otherwise bleak yet hauntingly accurate summation of nuclear war. Though undoubtedly, in the toxic and empty fog that would follow a nuclear apocalypse, that would stand as the endless, futile, empty and pointless future of our once beautiful world, the only evidence that would remain of our brief and violent mission to destroy each other would be fossilised bones, one other thing would remain in the desolate wastelands of a world destroyed that Shirer failed to recognise. And that, of course, would be the Nokia 3210. Built like a brick and twice as hard, the Nokia 3210 was the phone of all of our childhoods. It was the first phone of a generation, as we wiled away the small hours flicking through our ringtones and playing Snake. These days, if you drop your smartphone on the floor, it’s gonna costs a fair whack to fix that cracked screen. But what happened when you dropped a Nokia 3210 on the floor? Firstly, the tarmac would probably crack, and secondly, the phone would laugh in the face of gravity, dust itself of, and remind you of your progress in Snake. If you had one of these, I salute you. Even though I never used it, there was a slight feeling of less when I discovered that teletext would be closed once and for all. The same was felt in me when it was announced that the analogue signal, that had served this country since the beginning of the TV, would be finally switched off. I barely used either of them, but with them available it reminded me of one’s relationship with things like lawyers, insurance or the police – you never think about them on a day to day basis, you may never use them at all, but in an emergency, it’s nice to know they’re there for you. For those of you who don’t remember, Teletext was basically the Google newsfeed of its day, you’d go onto the Teletext channel and have a look at the news of the day. Fun Fax was the kid’s version of the adult FiloFax, so you know it was something that was huge in the 80s and especially the 90s. For those of you who aren’t familiar with the FunFax, it resembled a ring binder in which kids could collect individual booklets on almost every topic. It was a fun thing to collect and it also had a lot of potential to be genuinely intellectual. The king of games consoles as far as I’m concerned, if there is one single item that so perfectly represents a decade, it’s the Sony PlayStation for the 90s. Released in 1994 in Japan and in 1995 in Europe and North America, the PlayStation changed the game (no pun intended) for console developers. It combined gaming for all ages and all situations. You had games like Crash Team Racing if you wanted to play with a load of your mates. There were games like Rayman, Hogs of War and Worms if you were quite young but you fancied to be really challenged, and you had games like Silent Hill and Resident Evil if you were a grown up and still enjoyed gaming. The PS1 dominated the 90s, and sold over 100 million units, making it the second best selling console of all time, and such is the influence of the original PlayStation, many of the most well regarded games these days are either reboots of old games, based on old games, borrow elements of old games or sequels of old games. It would be a bit redundant to say if you owned a PlayStation, you were a 90s legend, because almost everybody either owned a PlayStation or knew someone who did own one in the 90s. But if you still have one, you most definitely are!